Welcome to the Hana Homestead, your eco friendly retreat in the center of Hana town! The location is perfect for all your outings in Hana, as it is situated close to everything! Only a 3 minute walk to Hana Bay, walking distance to stores and restaurants, and only a short drive to other beaches and hikes. It also has a beautiful ocean view from upstairs and down, so you can enjoy the wonderful sunrise and sunsets while sitting on the spacious lanai. This home has been newly renovated, with a focus on green living. Beautiful details have been added to this home to make your stay here healthy and unique. Some of the touches are: zero voc interior paint, low flow toilets and fixtures, hardwood bamboo flooring, cool travertine tile, cement countertops, and sustainable wood accents as tables and windowsills. We also use natural cleaning products, and provide natural soaps and shampoo for your stay. There is a large yard surrounding the home, making it feel spacious and removed while still being in the center of town. There is edible landscaping, all young but including berry bushes, orange and lime trees, turmeric, ginger, taro and herbs. This is the ideal spot to stay while in Hana, as it is a large home that can accommodate 6 very comfortably. There are two floors, with two bedrooms (with queen beds) and one bathroom upstairs, as well as the open concept living room and kitchen, with dining area. Downstairs has one large bedroom with a king sized bed, a beautiful bathroom, and a family room area which includes a juice bar and extra refrigerator. The home also includes an upstairs covered lanai overlooking the ocean, a large back deck for outdoor dining and star gazing, and a downstairs covered patio that also has a sweet ocean view. 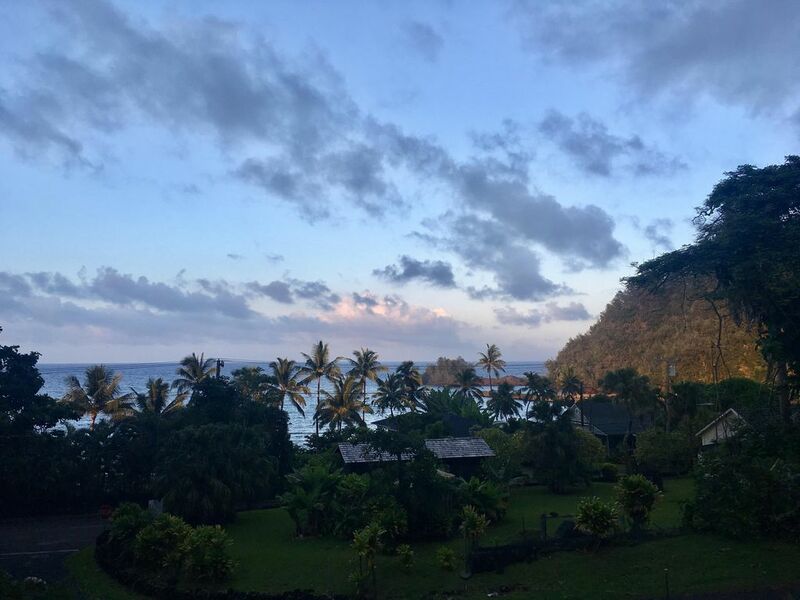 So whether you are out all day and need a comfortable and luxurious place to retreat to at night, or you want a cozy place to stay in for a day and play games, watch movies and make great meals, The Hana Homestead is the place for you. We look forward to hosting you, Aloha! We had a fantastic stay at the Hana Homestead. The house was impeccably clean, and was fully stocked with everything we needed. The space is large enough for two families with small kids to share, and is close to everything. We’ll be back! Beautiful View from the balcony and living room. Great View. Nice large house for our family group of 8. Several of us used the massage chair on the first level, the kids really thought that was fun. Nice upgrades throughout the house. Would stay again if we ever drive the road to Hana again! Great place with wonderful view! Great place with wonderful views!! Beautiful, peaceful and very high end! Beautiful property! We all loved our vacation there. Perfect location, awesome view with all the amenities we wanted. Highly recommend for a family vacation! We will be back. Loved this house, the location, and the views are awesome! We live on Maui and love to get together with the family in Hana. We have stayed in alot of places over the last 35 years, and they are all mediocre at best. We finally found the perfect home! We loved the covered lanai in the front to shield us from the rain, and the large back lanai was great for bbq, with picnic table and amazing views from both lanais. The kitchen is well stocked, which you rarely find in a Hana rental. Everything was well stocked, towels, beach gear, washer/dryer, it has it all! The furniture is new, there is a big dining table for everyone, comfortable beds upstairs, and the whole place is nicely decorated. We all loved this place and can’t wait to come back next time!! The house was clean, had an excellent layout, and beautiful views! The house had a good, centralized location in Hana. With two separate common spaces on different floors it was easier to find privacy with a larger group. The views were amazing as well.